I am deep in the middle of studio cleaning/reorganization. I am looking at boxes and saved material and evaluating if I need to keep them. One of the boxes is filled with letters from Word Play, my entry into Outdoor Sculpture at Maudslay. 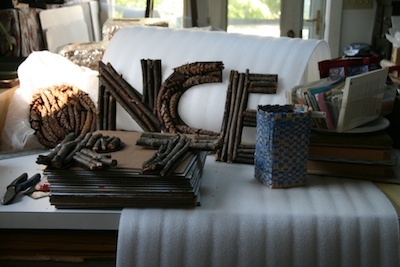 I have decided to keep four of the letters spelling the word "once." I'll be offering other letters and more studio sale/giveaway items here on the blog and on etsy over the next few weeks as I continue to sort. I'm a big believer in the need to make both physical and psychic space for the new.